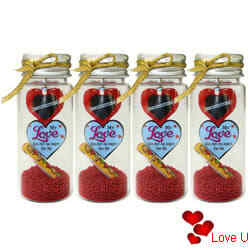 Convey your heartfelt wishes by gifting this Romantic Gesture Message Bottle Pack (4 Pcs.) on this auspicious occasion of Valentine's Day to the person dearest to you. Flowers Delivery Agra, Send sweets Nagaur, Wedding Cake Udupi, Diwali Mithai Nadiad, Send Flowers and Gifts to Solan, Online Shop Shencottah, Flower to Malappuram, New Year Flowers Jalgaon , Fresh Fruits Saharanpur, Send Gift Rourkella, Dry Fruits to Udipi, Birthday Delivery Ankleshwar, Sending to Warangal, Flower shop Tirupati, Kanpur Online Cake Delivery.